Aquaponics is a food production approach that leverages the symbiotic relationship between fish and plants. What could be better for the planet than growing vegetables using about one-tenth of the water normally used? How about producing a low-fat protein source in the form of your favorite fish while you are at it? James Nelson of Sunray, Texas, is doing all those things with a do-it-yourself aquaponics system he built in his own backyard. “I was already gardening so when I heard that aquaponics was more water conservative and you don’t have to put up with all the weeding, I was very interested,” said Nelson. In an aquaponic system, the plants are grown in a controlled environment that reduces the occurrence of weeds and makes it easy to eliminate any weeds that do come up. Aquaponics is a food production approach that leverages the symbiotic relationship between fish and plants. One of the biggest concerns in raising fish for food is that the accumulation of fish waste can become poisonous to the fish. In a traditional fish farming operation, this issue calls for regular changing of the water in the tanks. The system pumps the water and nutrients out of the tank and into grow beds filled with a growing medium like gravel, lava rock or specialized clay pellets. 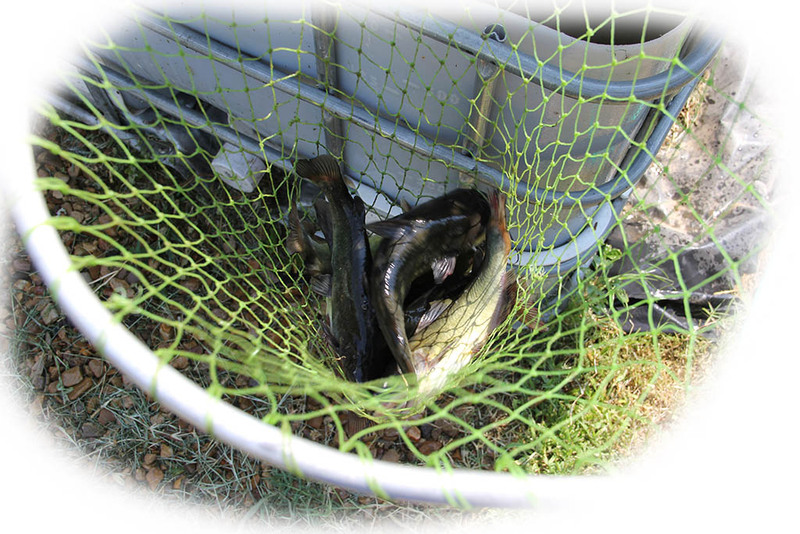 Fish waste is high in the nutrients plants need to thrive. The growing media allows the plants to more easily access the water and nutrients than they could in normal soil. The roots of the plants are literally soaked in the nutrient-rich mixture of water and fish waste. Once the plants have removed most of the nutrients from the water, it is returned to the fish tank, cleaned and aerated to provide a healthy environment for the growing fish. 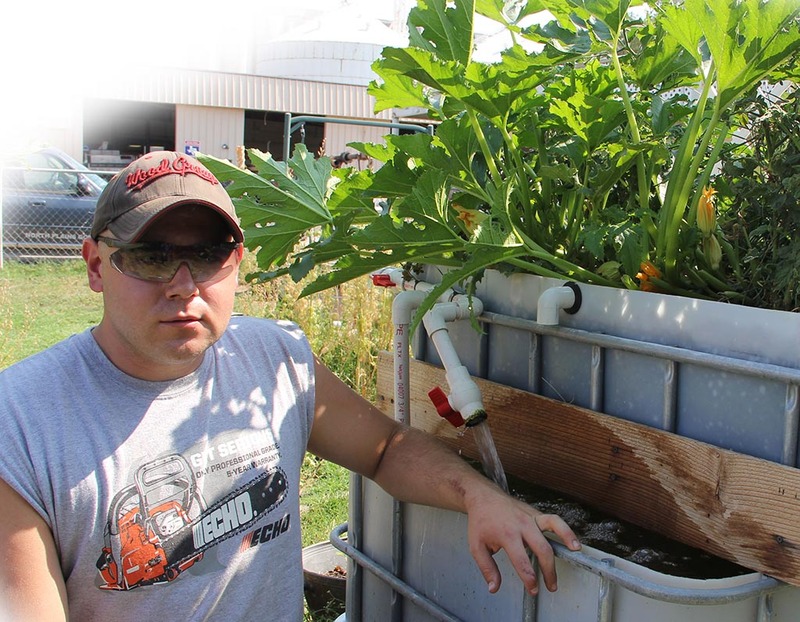 James Nelson shown here with his DIY aquaponics garden. “I like to eat fish, so being able to raise my own fish and know what comes out of the system is organic was appealing to me,” said Nelson. “You have to be careful about putting any chemicals on the plants that might hurt the fish and vice versa, so there’s a check in place to make sure it stays all natural,” Nelson said. “I started out doing lots of research on it to find the least expensive way to get started to make sure it would work. Since then, I’ve built two systems for myself and one for a friend, with more projects in the works,” he added. Sounds great, right? But if this system is as smart as it sounds, why aren’t more people getting involved in aquaponics? They are. 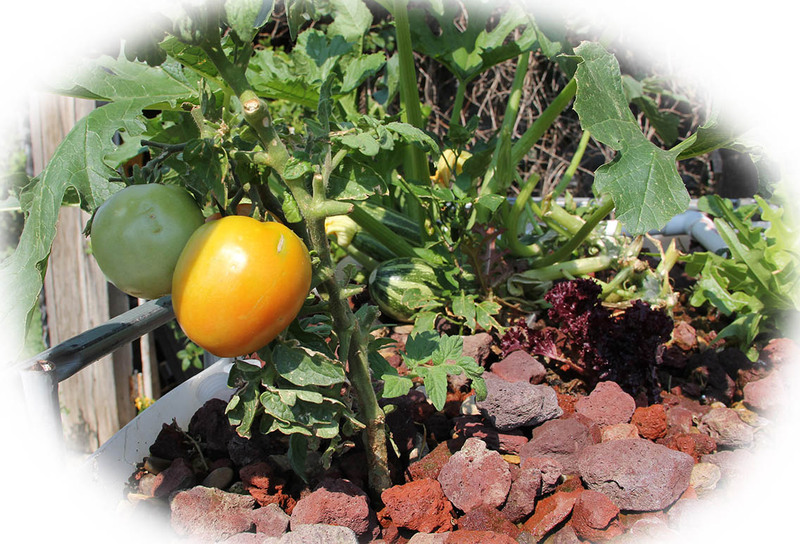 There are many people across the country and the globe using aquaponics principles. There are clubs and web communities of aquaponics enthusiasts with systems ranging from an indoor fish tank and kitchen herb garden, to multiple tanks with a greenhouse full of grow beds. While most large-scale aquaponics operations are non-profit or educational, the practice is even being applied with some success in commercial operations. Water used in aquaponics is continually circulated through the system, so none is wasted, though some is lost through plant transpiration and evaporation. Periodically, more water needs to be added to the system, but because there is no loss to run-off, much less water is used compared to traditional gardening. Other benefits include the elimination of the need for chemical fertilizer in the growing process and the fact that a system can be set up almost anywhere. Aquaponics systems may offer one way to address food shortages around the world, while conserving clean water. “There are actually groups that are helping villages in countries in famine to train the residents so they can have a system and create an almost self-sufficient food source,” said Nelson. So, if you are already a gardener and looking for something new to try, or if you never thought you had the space for a garden, aquaponics may be a way for you to grow better food more efficiently. For more information on aquaponics and how to start your own aquaponics adventure, please visit the links included below. For more information about aquaponics, please call the North Plains Groundwater Conservation District at 806-935-6401, email kwelch@northplainsgcd.org or contact James Nelson at jamesn69_04@yahoo.com.